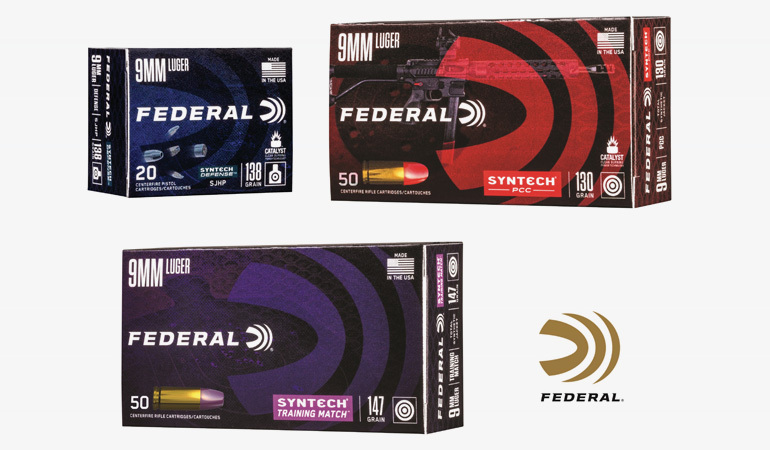 Federal is introducing three new types of Syntech ammunition: Syntech Defense, Syntech PPC and Syntech Training Match. These will all be on display in Booth No. 14551 at the 2019 SHOT Show, January 22-25 at the Sands Expo Center in Las Vegas, Nevada. Syntech Defense provides dynamic terminal performance with a hollow-point bullet that separates into three segments and a deep-penetrating core on impact. The core penetrates 12 to 18 inches through bare ballistics gel and heavy clothing—a critical benchmark in self-defense situations and the best terminal performance of any round in its class. The segments create three secondary wound channels, each more than 6 inches deep, adding to the terminal effect. Syntech Defense is available in 9mm Luger 138-grain, 40 S&W 175-grain, and 45 Auto 205-grain. Syntech PCC is built to meet the exhaustive demands of fast-pace Pistol Caliber Carbine competitions, with flawless function in carbine platforms. Velocity and accuracy are optimized for carbine barrel lengths, with a bullet profile that provides excellent accuracy and reliable feeding in a variety of platforms. Syntech PCC is offered in 9mm Luger 130-grain. Syntech Training Match loads offer the same velocity, trajectory and point of impact as equivalent Federal Premium Personal Defense HST and Tactical HST duty ammunition. Syntech Training Match is available in 9mm Luger 147-grain, 9mm Luger 124-grain, 40 S&W 180-grain, and 45 Auto 230-grain. Federal launched Syntech in 2017 as an answer to conventional ammunition, which causes metal-on-metal contact between the bullet and bore, reducing barrel life. The polymer-encapsulated Syntech bullet prevents this, while eliminating copper and lead fouling. Absence of a copper jacket also minimizes splash-back when shooting steel targets. Combined with specialized clean-burning powders, the technology keeps guns cleaner, longer, so you can shoot more—and shoot better. Finally, the exclusive Catalyst primer provides the cleanest most consistent ignition possible. All those features and benefits are the reason Syntech received the 2017 NRA Golden Bullseye Award. In 2018, Syntech Action Pistol was introduced. This ammunition is specifically designed for the action shooting sports and loaded to power factor requirements with heavy, flatter-nosed bullets for more reliable knock-downs on steel targets in competition. For more information, visit www.federalpremium.com.